In the following article, we will start with the basics of an Achilles tendon injury before we introduce treatment options, recovery and physical therapy tips, as well as helpful information about mobility device options. There is a wide range of symptoms that you may experience when you injure your Achilles tendon, from a weakness in your leg, to hearing an audible ‘pop’ followed by extreme leg pain. Whether you are experiencing one of these symptoms, or already have an Achilles tendon rupture diagnosis, there are many questions to answer. The Achilles tendon is one of the longest tendons in your body. It’s the springy band of tissue that connects your calf muscles to your heel bone and you use it every step you take. Every time you walk, run, jump, dance or do anything that requires use of your legs you’re engaging your Achilles tendon. Unfortunately, the Achilles tendon is a commonly injured tendon. 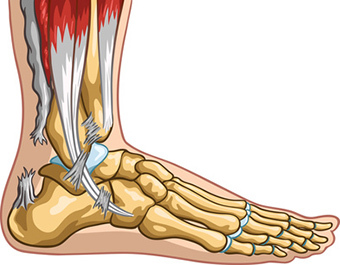 Many Achilles tendon injuries are caused when the tendon becomes swollen and painful, or by tendinitis. In the most severe Achilles tendon injuries, too much force on the tendon can cause a partial Achilles tendon tear, or in the worst cases, a complete Achilles tendon rupture, which is when the tendon is torn completely. The Achilles tendon has a massive job to do and can usually withstand great stress from running, jumping and all of our daily activities, but the Achilles is also prone to tendinitis, which is an inflammation of the tendon, and rupture, a condition associated with overuse or degeneration. In an Achilles rupture, the Achilles tendon itself tears, either partially or completely. This can happen due to degeneration, in which the tendon loses its organized structure and may begin to develop microscopic tears over time, or can happen acutely from an injury. Achilles injuries most often occur when pushing off of the foot, such as when jumping or accelerating, which creates sudden force or stress on the tendon. 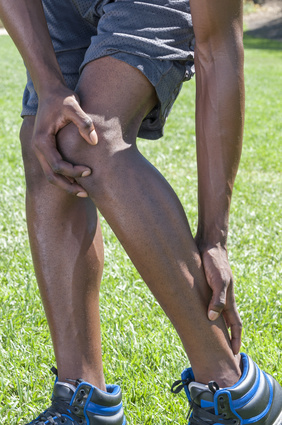 This is often seen in sport related injuries, such as running, dance, tennis, volleyball, football, basketball, baseball and other sports that require a lot of quick stops and starts. There are many reasons why an Achilles tendon can weaken and/or get injured. Common reasons are from medications, disease, age, high heels, arch issues and overuse. Additionally, a sudden increase in your physical activity and lack of stretching tight tendons in the leg are other common factors that can lead to an Achilles tendon injury. If you have any of the above symptoms, we highly recommend seeking immediate medical attention for a complete diagnosis of your Achilles tendon to find out the severity of your injury. The definitions below are benchmarks of severity for your Achilles injury. If you suspect an Achilles injury, then read on, but as mentioned, we also recommend that you confirm your self-diagnosis and seek help from a physician. The physician will perform further testing by visible soft tissue depression like the Thompson test, visual observation and possible image testing such an MRI or ultrasound. If the tear is partial you may still be able to walk, but you will have a limp, often accompanied by severe pain when you push off with your toes or touch down on your heel (heel strike). • Occasionally a small gap will be visible or a palpable depression can be felt in the area of the tendon where the injury occurred in back of the calf. If any of these symptoms are present, it’s highly likely you have an Achilles rupture. You will want to have your injury assessed and verified by a physician right away to avoid more damage and give yourself optimal opportunity for recovery. If you have any of the above symptoms and cannot see a doctor immediately, you can treat your rupture at home for a short time. However, Achilles tendon injuries should not be taken lightly, and you can inadvertently cause additional damage, so see your physician as soon as possible. Start with Ice – Placing ice on the most painful area of the Achilles tendon is helpful to reduce swelling due to inflammation. To avoid injury to your skin, never apply ice directly to skin, instead, use a piece of thin material between the ice and your skin. You can ice for up to 20 minutes, three to four times a day, but make sure to pay attention to the skin. If it becomes red or numb reduce the time and/or frequency of the ice therapy. 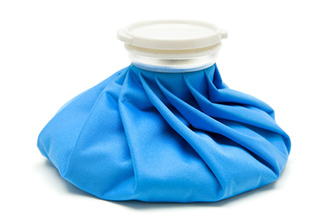 Get plenty of rest in conjunction with the ice treatment. It is best not to walk or stretch the torn or ruptured Achilles tendon, especially if you have extreme pain. You may want to take some type of pain reliever to help with the initial discomfort of your Achilles tendon rupture. Many over-the-counter medications are used not only for pain relief, but also to reduce inflammation. Common over-the-counter pain relievers such as nonsteroidal anti-inflammatory drugs and aspirin will reduce inflammation. It’s important to follow the instruction of the pharmacist and physician regarding the use and time frame of any medication. Improper or over use of over-the- counter medicine can lead to more serious damage to the body and internal organs. Allergies should also be considered for any medication, if known. 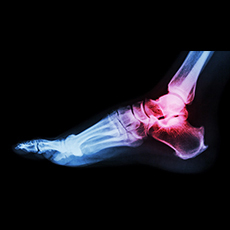 Once your physician has diagnosed that you do indeed have an Achilles injury, (partial Achilles tendon rupture or full Achilles tendon rupture), you may be presented with options for treatment and repair of your Achilles tendon injury. • Casting the foot with the toes pointed down. • Recasting – Each week a new cast is applied which gradually decreases the amount of flexion (toes pointing down) in your ankle. This allows the Achilles tendon to heal while gradually increasing the stretch in the tendon. While one can appreciate the value of non-invasive procedures, you should know that the recovery rates from this procedure are not encouraging. Non-operative care has demonstrated a re-rupture rate from 10-30% where surgical re-rupture rates are around 3-4%. 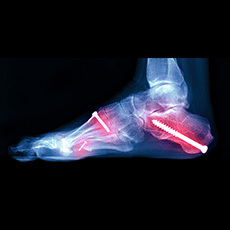 This involves a single large incision on the back of the leg, debridement (removal) of the damaged tissue and then using a tendon transfer from your big toe or a cadaver tendon sewn into the remaining portion of your own Achilles tendon to repair and strengthen it. This is a new technique called Percutaneous Achilles Repair System (PARS) in which the surgeon repairs your torn Achilles tendon through a much smaller incision. In this surgery the damaged tendon isn’t removed, instead the damaged tendon is used to make the repair. 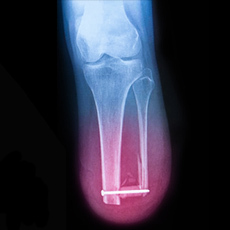 The PARS procedure creates a 2-cm horizontal incision located about 4-6 centimeters above the heel to insert the PARS device up (towards the knee). A special medical device makes this procedure possible. The PARS device has four prongs, two that go inside the leg to hold the tendon in place and two that go outside the leg. All four prongs have 8 small holes that allow the surgeon to install suture all the way through the tendon. This is done because the Achilles tendon doesn’t just snap or tear evenly, it shreds so that the ends appear similar to a mop head, so it is essential to suture the whole tendon to get a strong repair. Once the top of the tendon is secure the surgeon will pull the threads tautly and secure the two ends of the tendon together. Held in this position, the Achilles tendon will mend and heal. This procedure is not for everyone. The tendon injury cannot be more than 10 days old and you must have a physician in your area that performs this specialized Achilles tendon specific procedure. Since Achilles ruptures are so common, surgeons are constantly coming up with new, innovative surgical procedures for repairing Achilles tendon ruptures. • Skin infection at the incision site. • Normal complications of surgery and anesthesia. • Risk of repeat Achilles rupture. This risk is around 3-4% of re-rupture versus 10-30% for nonsurgical treatment. • Decrease in the range of motion of your Achilles tendon. Rehabilitation is very important to get back full range of motion. After either type of surgery, you will likely wear a cast or walking boot, for 6 to 12 weeks. At first, the cast or boot will keep your toes pointed downward as the tendon heals. It is then gradually adjusted until your foot is in a neutral position. This will require you to be non-weight bearing, which means you have to stay off of the leg and not walk on it. Your doctor will advise how long you will be non-weight bearing depending upon various factors. During your non-weight bearing period, it’s essential that you do not put any weight on your injured foot. You will have several choices of devices to use when you are non-weight bearing. 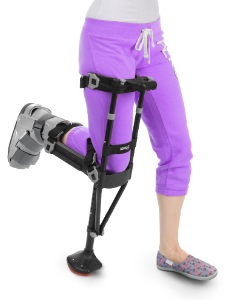 • Traditional crutches –Traditional crutches will allow you to walk without putting weight on your injured leg. They are inexpensive and readily available, but conventional crutches have several disadvantages you should be aware of. 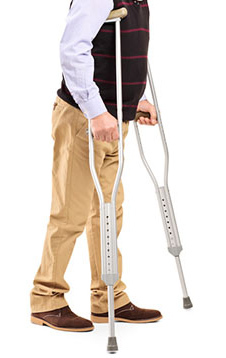 Pain is the number one complaint from conventional crutch users. Pain under your arms (chafing), and in wrists, hands and elbows are common. Common activities like walking through a door, pushing a shopping cart, going to work, and cooking in your kitchen are difficult or impossible on crutches, which leads to widespread “cheating”, which consists of momentary weight bearing on your injured leg. This can cause re-injury or a prolonged recovery time. Because of these limitations of conventional crutches, patients often begin walking on the injury too soon, which causes further complications in healing. • Knee scooters or “knee walkers” – Knee walkers or Knee scooters, as they are commonly referred to, are becoming increasingly popular. 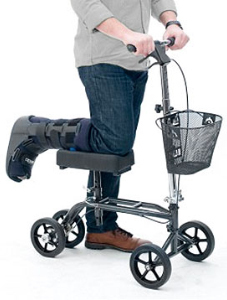 With a knee scooter, the user bends their injured leg 90 degrees at the knee and kneels on a platform that is attached to a frame which has four wheels. The user steers the knee scooter with handlebars, much like a bicycle. For long distance mobility, knee scooters are a big improvement, but they do have some significant disadvantages. With a knee scooter, both hands are required to control the device, so scooters are quite restricting when performing your daily activities. Even something simple like going through a door can create quite a challenge. Getting into a car requires that the heavy, bulky device be stowed in the trunk or back seat. The turning radius of scooters is limited, so trying to navigate or perform tasks in restricted areas, such as a kitchen, is limited. You cannot use knee scooters on stairs, in small areas, on slopes, or uneven terrain. ⋅ Hands Free Crutch (iWALK2.0) – The hands free and pain free, iWALK2.0 is the latest mobility device to enter the market. Similar to the knee scooter, you kneel on a platform, but with its straps secured properly, the device becomes an extension of your natural leg, functioning much like your own leg would. Because your upper leg is performing the same muscle memory routine of normal walking, learning and using the iWALK2.0 crutch is very easy and intuitive. Unlike the knee scooter or conventional crutches, your hands and arms are free to perform normal day to day tasks, so walking through a door, pushing a shopping cart, doing laundry, walking your dog, etc. are all routine. Stairs are easy to navigate, plus your hands are free to hold the rail. You can even use the iWALK2.0 in the shower. On the clinical side, unlike crutches or scooters, with the iWALK2.0you’re utilizing the muscles in your leg, so muscle atrophy is reduced. Partial elevation of the lower leg is also achieved. Clinical trials have also revealed that people with lower leg injuries using the hands free crutch have healed faster than with conventional crutches. Maintaining emotional well being due to retaining your independence is a significant benefit of the iWALK2.0crutch. To learn more about the iWALK2.0, click here. Physical therapy will be an important part of your post-surgery or non-surgical recovery. With most injuries, the harder you work on your physical therapy, the better and faster you recover, but that’s not necessarily the case with your Achilles tendon rupture recovery. Your Achilles tendon needs time to heal properly. Remember, it’s the biggest tendon in your body so giving it proper time to mend correctly is very important. Below are some common questions regarding therapy. Depending on your injury, physical therapy can be anything from deep massage, ultrasound heat therapy, stretching and strengthening. These treatments improve blood flow to the area to enhance the healing process. Strengthening exercises will be introduced at the appropriate healing stage to get your Achilles back to normal use and for avoiding future injury. This is a common question and depends completely on the severity of your Achilles tendon injury. Also the type of treatment you receive, whether surgical or nonsurgical, and a review of your medical history is a considerable factor too. It varies depending on the individual as well and how dedicated you are to the therapy given. Unfortunately, some people can never restore their abilities in competitive sports or running after an Achilles tendon rupture repair. It will typically be 4 to 6 months before you can perform any running activities. It may also take 12 months before you are pain free. Pain thresholds vary from person to person and also depend upon your treatment and injury – surgical or non-surgical treatment, partial or complete tear. Some of the strengthening exercises, involving the tightening of muscles can cause discomfort however it’s bearable by most individuals. These exercises done incorrectly can also cause damage to the repaired Achilles, which is why it’s highly recommended you practice them under a physical therapist’s supervision. Do I need a physical therapist? A physical therapist will serve as an educator as well as the person who administers the treatment such as massage and ultrasound heat therapy. They will teach you how to stretch, care, and most importantly strengthen your injury. Their goal for you is to relieve pain and inflammation, improve circulation to your Achilles tendon and get you gradually back to normal. A physical therapist offers invaluable support as they personally design a program based on your injury, treatment, activity and fitness level. Strengthening of the tendon (and your leg muscles) doesn’t happen until the very end of the healing process. This means it will take a long time to get back to your original abilities before the injury. Temper your expectations in advance so that you don’t overdo it and follow the therapist instructions. There’s an emotional side to having a physical injury. Having our bodies damaged and restricting our activities can have a pronounced effect on our emotional well being. An Achilles tendon injury can be very limiting and cause you to lose your independence. The severity of the emotional fallout varies from person to person, and frustration and boredom are common side effects. In addition, and consequentially, it’s often reported that depression can result from a debilitation injury. Maintaining a positive outlook is an important component of your Achilles tendon injury recovery. It’s essential that you maintain as normal of a life as your injury allows. Using a mobility device like the hands free crutch will allow you to continue to work and take care of your family during your recovery. Knowing you can be independent can significantly lift your spirits. It’s important to keep your life fulfilling as you recover, so perhaps this is a good time to embark on that new hobby you’ve been putting off. Keeping a positive attitude will insure that you are ready to work hard when it comes to rehabbing your tendon and getting back into the game of life. Water: Dehydration causes muscle tightness, which increases the risk of tearing or non-healing of your Achilles tendon. Pineapples: Bromelain, an enzyme found in pineapples helps reduce inflammation from injury. Dairy: It’s time to actually listen to your mom, and drink that glass of milk! The calcium found in dairy such as milk and yogurt is not just good for your bones, it’s good for rebuilding your torn Achilles tendon too. Go Nuts: Almonds, soy beans, peanuts (and peanut butter) all contain calcium and magnesium which help kick start the healing process of re-building your injured tendon’s connective tissue. Vitamin C: This famous vitamin does double duty. It helps repair torn tissue, and helps produce collagen. Collagen is not just an anti-aging miracle worker, but also a key protein your body needs to build tendons and ligaments. Oranges, bell peppers, and strawberries are just some of the options you have to meet your daily recommended dose. Vitamin E and Omega 3’s: Both of these help reduce post-Achilles tendon injury or post-Achilles tendon surgery inflammation. Easily add these nutrients to your diet by including fatty fish such as sardines or salmon, as well as almonds, sunflower seeds, leafy greens, and broccoli. Achilles tendon injuries are common, but can have a major effect on our lives. It’s important to remember to stay in good shape and listen to your body. If you have heel pain, calf pain or swelling of the back of the leg, cut back on your activities, ice and rest your leg. If the problem doesn’t resolve make sure to see your doctor. While any broken bone is both painful and debilitating, a broken tibia can cause loss of mobility for a significant period of time. If you suspect that you have fractured one of the bones in your lower leg, it is very important to seek medical attention immediately. This will prevent further injury and will get you on the road to recovery quickly. Adhering to your doctor’s recovery regiment is the key to getting back to your normal day to day activities as quickly as possible. And, fortunately, advances in surgical procedures and medical devices such as iWALK2.0 will help you get back to an active lifestyle in as little time as possible!